Found: a large structure looming against the otherwise natural skyline at Blue Ridge Parkway milepost 145. If anyone can correctly identify this unidentified edifice, it’s yours. It seems to have wondered into its current location since the last time I traversed that stretch of America’s longest national park and nobody seems to know its name or who it belongs to. As it certainly seems determined to stay in its new home, we might at least give it a name. Anyone? And its purpose and how it came to be situated in the viewshed of the parkway? I feel certain there’s a story here. Not even the Friends of the Parkway could tell me very much. Sean’s right…..I’ve spent weeks trying to muster up the courage to visit the place. Gorgeous isn’t it? I was hoping they made fruitcake. Maybe we should visit their book publishing set up, Fred. 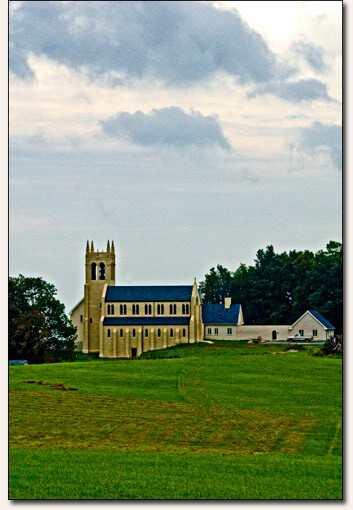 It is Syon Abbey, built by Benedictine Monks near milepost 145 on the Blue Ridge Parkway. Check out their website Syon Abbey. Next Next post: Noted: New Cards Are Here!